Galerie Lelong & Co., New York, is pleased to present a solo booth of work by Carolee Schneemann from the late 1950s and early 1960s for ADAA: The Art Show. Since Schneemann trained as a landscape painter and always considered it central to her practice, the booth will contextualize her groundbreaking performance as an extension of her painting and sculpture. Works on view revisit how the artist not only challenged gendered conventions, but also broke through the tenets of Abstract Expressionism that dominated the preceding decade. As early as 1957, Schneemann began extending painting beyond the canvas by cutting into painted layers, applying mechanisms that rotated her paintings, and creating assemblages in various forms. Schneemann was the first to coin the term “painting constructions” in the 1960s to describe her thickly painted assemblage sculptures; they included motorized elements and even singe marks from a controlled burning technique that Schneemann developed to randomize her materials. Facing doubt and disbelief that women could be “both image and image-maker,” Schneemann radically introduced her own body into her work. In 1963, she photographed herself within an environment consisting of her paintings and sculptures: Maximus at Gloucester (1962), Colorado House (1962), and Controlled Burning: Fireplace (1963-64). The booth features these works, placing them in dialogue with the resulting photographic series, Eye Body: 36Transformative Actions for Camera (1963). Born in Fox Chase, Pennsylvania, in 1939, the artist currently lives and works in upstate New York. 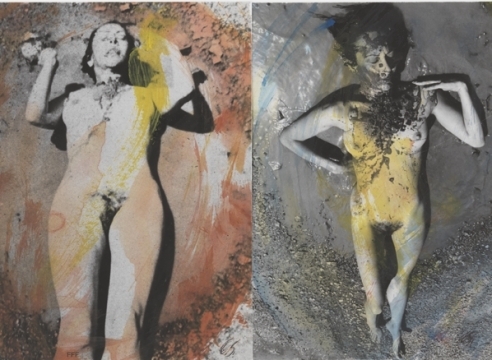 Galerie Lelong & Co. began jointly representing Carolee Schneemann with P.P.O.W. in 2016. Her critically acclaimed retrospective, Kinetic Painting, debuted at the Museum der Moderne Salzburg, Austria, and travelled to the Museum für Moderne Kunst Frankfurt am Main, Germany, and MoMA PS1, New York. Other major solo exhibitions include the multi-part Carolee Schneemann Residency at The Artist’s Institute at Hunter College, New York and Carolee Schneemann: Within and Beyond the Premises at the Samuel Dorsky Museum of Art, State University of New York, New Paltz. In 2017, Schneemann was awarded the Golden Lion for Lifetime Achievement at the 57th Venice Biennale. Schneemann’s work is included in major museum collections around the world including the Museum der Moderne Salzburg, Austria; Museo Nacional Centro de Arte Reina Sofía, Spain; Museum of Modern Art, New York; San Francisco Museum of Modern Art, California; Tate Modern, England; Centre Pompidou, France; and Hirshhorn Museum and Sculpture Garden, Washington, D.C.